Since meeting in 2003 and forming an instant friendship, Phoebe DeVoe and Claudia Kleinsmith have formed a long term, dressage oriented partnership based upon communication and honesty. Together, they have proven themselves successful with training horses, teaching riders, selecting sale horses, and subsequently matching them with new partners. What is most unique about Phoebe and Claudia is that, as professionals, they believe in owning several personal horses, at any given time. All of their horses have been purchased as youngsters, mostly aged 2 and under. Many of these youngsters have received high accolades at Breed Shows and all of them have gone on to become successful performance horses. 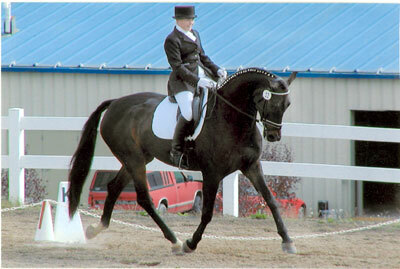 In 2008, Thornridge Manor was recognized as a top dressage training facility in the USA. Representatives from the American Hanoverian Society and from the German Verband have approved Thornridge Manor for Intro thru FEI Training, Sales and Inspection/MPT Preparation. To quote the Inspectors: "The US needs more facilities that are this top-notch, coupled with the services that you provide." We employ a full time groom and full time working students. Feel free to contact us if you have interest in joining Team-Thornridge!! !